Recently I’ve been thinking about Warpath, the new sci-fi wargame about to be released by Mantic Games. Since resolving to step back from Games Workshop products I’ve found myself suddenly exposed to the infinite diversity and infinite combinations of other wargames and miniatures out there. Mantic caught my attention a few months ago primarily through their products being available through the same sites I buy my /Firestorm Armada stuff through. I was impressed with some of the models for their fantasy game Kings of War – particularly their dwarfs, and by the fact that the rules and army lists were available to download for free. A gaming company giving something away for free? Whatever next? Not long afterwards the development of Warpath was announced. Although I wasn’t that interested in the fantasy range, the prospect of a sci-fi game was certainly intriguing to me. Sadly, although I have downloaded the beta test rules for warpath, I have not had a chance to read them yet. Though I did read the Kings of War rules a while ago and got the impression that Mantic’s developers seem to know what they’re doing. Especially given that ex-GW developer Alesseio Cavatore is taking the lead in developing Mantic’s rules. There has been some discussion of Warpath on the Shell Case Forum. A few people have wondered if the game is just a stripped down, version of Warhammer 40,000. I can see their point, the fact that the first two armies to be released are Marauders and Forge Fathers (which are very reminiscent of the Orks and Squats/Demiurge of the 40k mythos) does not help this impression. On the other hand, by that sort of logic, you could write Warhammer (and any other fantasy setting) off as a warmed-over version of Lord of the Rings. The question will be how Mantic uses these archetypes in the creation of both the Warpath game and the universe in which it is set. 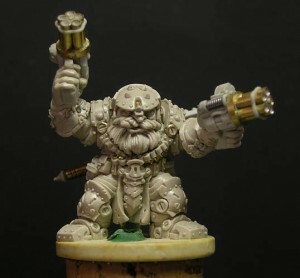 Of course, comparison to 40k is inevitable, given that they are both 28mm wargames set in a science fiction universe populated by archetypal fantasy races. In some ways though that might work in Mantic’s favour, for one thing it serves as a nice demonstration that there is an existing market for such a game and positions Mantic nicely to potentially draw in any disgruntled 40k players who find themselves looking for something different but comfortingly familiar. If Kings of War is anything to go by, Warpath will probably be able to corner the ‘easy to learn, difficult to master’ angle quite well in stark contrast to the more complicated GW game. Mantic also have the advantage of being noticeably cheaper than GW. 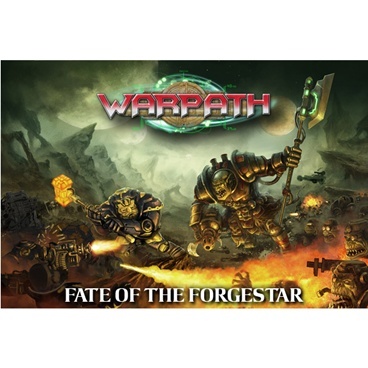 At the time of posting, the first army-deals and the starter set for warpath have gone up for pre-order. Curiously though there aren’t really any images of the models that people would be ordering when they opt in for these deals, which I can’t help but feel might hurt take up. 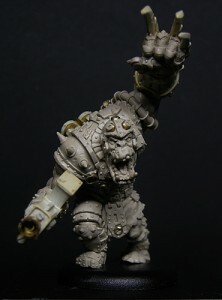 The models we have seen so far though – primarily the Marauder and Forge Father Heroes – have been quite impressive. I’m not sure where I stand on Warpath. Partly because it’s far to early to tell what it really has to offer. At the moment the most I can imagine doing is buying a few Forge Fathers to paint up. But I will see how the game develops, and perhaps more importantly, what the factions and models end up looking like. I think I’m going to be circumspect because Warpath, like Kings of War is ultimately a games for big armies, and I’m not sure I want to get into something that requires a lot of purchases to make the most of the game – even if they are at Mantic’s more affordable rates. So this particular foray into the alternatives offered by the wonderful world of gaming results in a shrug and a ‘don’t know’. But there are plenty of other games that I have had my eye on which I will hopefully hold forth on another time.